All of the educational programs involved in the CIPE are incorporating IPE into their curriculums. Click through the list below to learn more about all of the major IPE activities our students are participating in this year. The First Year IPE Sessions are the introductory component of CIPE's longitudinal curriculum. First-year, professional-level students from all seven academic programs learn about each other’s roles and responsibilities within the healthcare team while also fostering communication and teamwork with the overarching goal of improving the delivery of health care. This experience was piloted in AY14-15, launched in AY15-16 and was revised for AY16-17 – AY18-19 based on feedback from both students and facilitators. In the meantime, CIPE CAC representatives have worked with their profession-specific curriculum committees to finalize the IPE curriculum framework and is currently working to develop and integrate the Phase I Universal Introductory Activity for Fall 2019. This series of three 2-hour workshops involves interprofessional collaboration with first-year, professional-level students from all seven academic programs. During these sessions, students are grouped in interprofessional teams and participate in a variety of activities and exercises designed to encourage the understanding of self, others, and their team. Teams continue working together for each of the three workshops, rotating to a different location at one of the institutions on each date. The broad goal of this experience is to introduce the students to the fundamental principles of knowing about and valuing the roles of the members of interprofessional health care teams. Understand that delivery of safe and effective patient care is a team effort. Explain aspects of your personal identity that impact your role as a team member. Describe the complementary nature of members on an interprofessional team. This session is a hands-on experience with multiple healthcare professions (medicine, nursing, occupational therapy, pharmacy and physical therapy). Students practice novel ways a healthcare team might function in order to effectively and efficiently care for a hospitalized patient/client. IPE student teams determine how to work together to take a history and physical and develop a care plan for a standardized patient; the experience is then debriefed by an IPE faculty team. The goal for this session is to develop an integrated, interprofessional treatment plan that reflects the roles and strengths of each member of the care team as well as the needs of the patient. This experience initiated in 2009 with medicine and nursing students and has since been expanded and adapted based on feedback from participants and the curriculum team. Further development and placement of this experience will be informed by the integrated, longitudinal interprofessional curriculum being developed by the Curriculum and Assessment Committee. Organize and communicate information with patients, families, and healthcare team members in a form that is understandable, avoiding discipline-specific terminology when possible. Express one’s knowledge and opinions to team members involved in patient care with confidence, clarity, and respect, working to ensure common understanding of information and treatment and care decisions. Use the full scope of knowledge, skills, and abilities of available health professionals and healthcare workers to provide care that is safe, timely, efficient, effective, and equitable. In the Spring of 2018, CIPE piloted an innovative IPE experience focused on the transitions of care process to determine feasibility of incorporating the experience into all programs’ curricula. In addition, coordinators wished to gain student insight into the value of the experience to generate ideas for future expansion of experiential offerings. Twenty-five students, five from each profession (medicine, nursing, occupational therapy, pharmacy, and physical therapy), volunteered to participate in the pilot. The pilot was structured into three phases. Learners completed the first phase on their own by reviewing two online cases focused on transitions of care. The St. Louis College of Pharmacy provided funding for use of the CareCases software from CaseNetwork®. Themes of the cases centered on medication management and transition planning/ information transfer. Learners received discussion questions to prepare for the in-class session that followed. The second phase consists of an in-class discussion session. Each learner is assigned to an interprofessional group with one learner from each profession. All groups discussed both cases during the two hour class session, and the experience ended with a large group debrief presentation emphasizing best practices and important takeaway points from each case. The last phase of the pilot is an experiential activity. Each interprofessional group meets with a medical resident facilitator to walk through a simulated discharge on a hospitalized patient. The facilitator highlights issues to address for facilitating a safe discharge. In fall 2018, a modified version of the case exercise will be incorporated as an IPE session in the IPE Transitions of Care course in the pharmacy curriculum and as an elective experience for the other programs. To learn more about the pilot click here. Recognize the individual’s professional role during transitions of patient/client care. Identify barriers to safe transitions of care. Evaluate effective strategies to enhance safety and improve communication during care transitions. The Independent Living Center Pilot offers learners the opportunity to work with a learner from another profession while interviewing an older adult community participant volunteer at their home. The learning team receives an orientation to the activity, available community resources, and social determinants of health. Learning teams meet with their community volunteer two times. The first visit focuses on building rapport, exploring the volunteer’s management of health and wellness, current health needs, and barriers to healthcare. Learners ask the community volunteer to complete the Home Safety Self Assessment Tool (HSSAT). After the visit, learners discuss possible community resources to address the community volunteer’s unmet health needs. During the second visit, learners review the HSSAT with the community volunteer and review their medications together. All of the learning teams then come together with the facilitators for a large group debriefing. Learners are assigned to one of 16 larger teams for a group discussion led by a CIPE-trained facilitator. Teams will present their team reflection with other teams’ members and discuss their site visits, observed barriers to healthcare, and teamwork skills. To learn more click here. This experience was newly developed in the Spring of 2016. It is an elective for year-three physical therapy students and is required for year-two medical students. The PT students teach the MD students safe handling techniques for moving patients in bed, to and from examination tables, and in and out of wheelchairs. 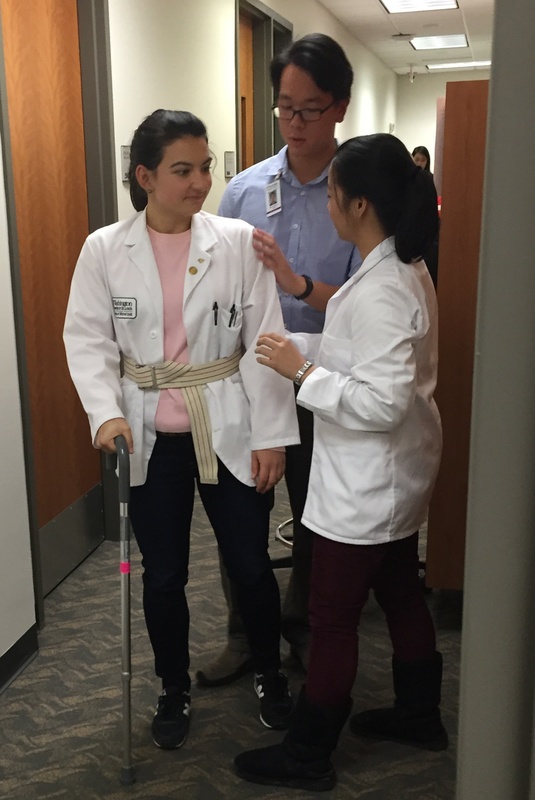 The medical students will recognize the skill physical therapists have in applying good body mechanics to move and assist patients. Describe basic principles of correct body mechanics for the health care worker. Describe how to assess a patient’s ability to move, bear weight, and maintain balance. Demonstrate how to assist a patient to arise from a chair, ambulate across the room, and get onto an exam table. Demonstrate how to move patients safely: move between sitting and supine, transfer between a chair or wheelchair and bed, and move the patient up in bed. List the types of patients where special precautions need to be taken to assist them in moving (e.g. possible cervical injury, person in a halo vest, obesity, and post-surgical movement limitations). St. Louis College of Pharmacy and the Missouri School of Dentistry & Oral Health recently joined forces to bring students together for a meaningful interprofessional experience. A total of 24 students - 12 third year dental students and 12 fourth professional year pharmacy students participated in the pilot program. On two separate dates, 6 dental and 6 pharmacy students were partnered to see patients in the St. Louis Dental Center intake clinic. Students address patients in teams of two for the interview: dental students asked about the health history and pharmacy students collected a thorough medication history. Pharmacy students then watched the dental exam (specific things were noted to pharmacy students by dental students). Both students provided education: medication-related by pharmacy students and dental care-related by dental students. Both students worked on documentation of the visit together. Both programs plan to repeath this interprofessional experience and are discussing other opportunities to encourage meaningful interactions and learning opportunities for the students. In this activity, MD and Pharmacy students teamed up to work interprofessionally on a case study for an individual with asthma. Students worked together to address all aspects of the case, develop treatment plans, and strategies to increase adherence to inhaler use. 360 students participated in the fall 2018 session in teams of six, two MD students and four pharmacy students. Identify MDI, DPI and SMI when presented with a description and/or picture.